Pottery Parties Make Learning Fun! 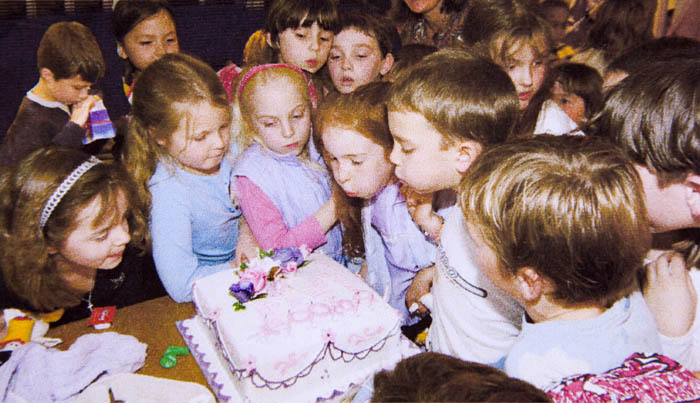 Whatever your celebration, be it a child's birthday, corporate party or social occasion, why not have creative fun celebrating in a private pottery and art studio overlooking Richmond Park, with off-street parking, use of open plan ground floor venue inclusive of welcoming hallway, conservatory kitchen, choice of toilets and large garden. Being creative together with others can be something that is fun to do. So why not give your child or a friend a gift that will fire their imagination. No need to worry about making a mess, this is an opportunity for free self-expression. 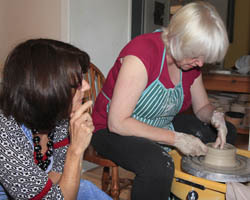 A pottery party with friends is a great opportunity for everybody to unleash creativity, problem solve, improve hand to eye co-ordination and boost self esteem. We help you achieve a work of art and fire your creations in our kiln. To ensure everyone is assured of personal attention from an experienced teacher, numbers are kept to a maximum of 14 children, 10 adults. After the creative session and hand washing, party celebrations with cake and refreshment can begin in our open plan conservatory kitchen which opens onto a large private garden. Workshops: Make a wonderful gift for someone. Clay is a wonderful tactile medium that many people have never experienced before. Its three dimensional nature forces you to think about structure, shapes and form. Once you learn to express and execute your personal visions in clay, you become empowered in ways that go far beyond the walls of the ceramic studio. Longfield Studio allows you to experiment with a variety of hand building and throwing techniques while you find your potential. 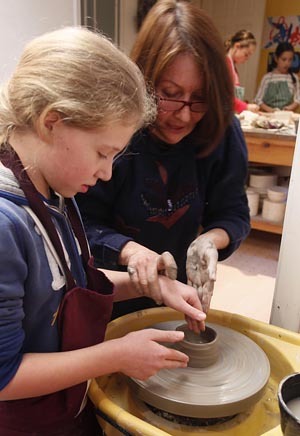 You can book a one-to-one couple workshop or a parent and child session with an experienced and trained ceramic teacher to learn a particular skill or come in a family or company group for a workshop tailored to your ideas. The studio also offers facilities for potters wanting to find a peaceful place to work on a long-term basis with use of kilns, clays, glazes and ceramic equipment. 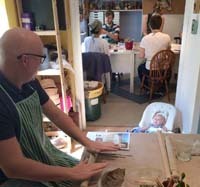 Longfield Potters find our voucher scheme allows the flexibility to come to the studio at their own convenience. Children's Mixed Media Art Courses: Book now for NEW Spring 2019 art course. 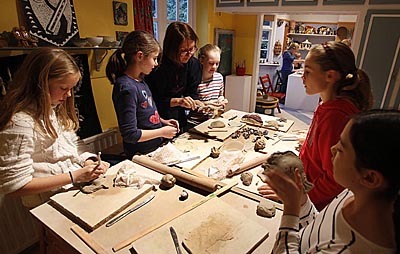 During this term in our short course March 4- April 3 children will draw and make masks of American Indians, sketch, paint and glaze tiles with exotic bird designs of their own and prepare coloured clay to produce miniature landscapes . There will be plenty of visual stimulation from history of the British in America. Children will be introduced to the continuing discoveries of the ‘lost colony of Roanoke’, the tribal portraits by George Catlin, wild birds by John Audubon and landscapes by Thomas Moran. We will cover varied art techniques to inspire the children, and end the course with a public art exhibition of all the work April 28/29.